Alinghi won the only race on day three of the third Act of the 2017 Extreme Sailing Series™ in Madeira Islands. 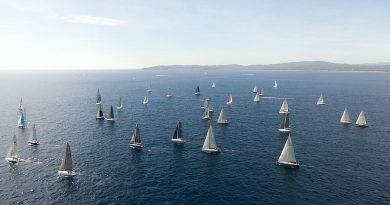 However, the leaderboard remains unchanged, as shifty conditions and winds blowing from opposite directions prevented further racing. This leaves the rest of the fleet only tomorrow to catch current leader SAP Extreme Sailing Team. 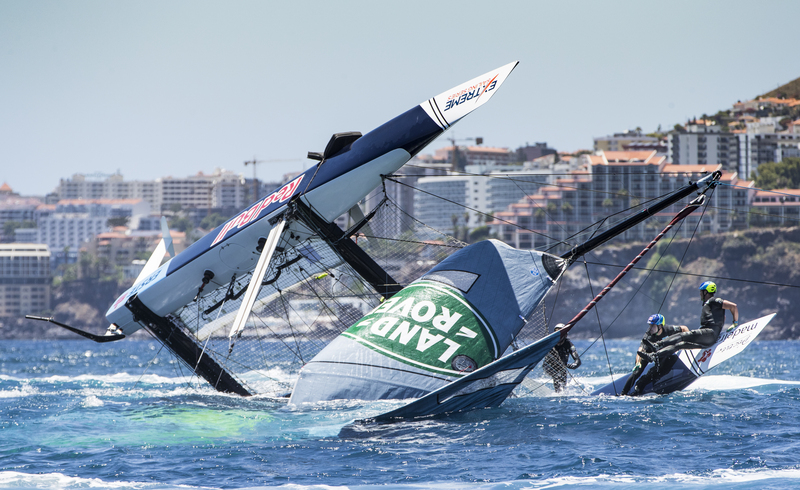 Red Bull Sailing Team was unable to start the only race of the day because of damage sustained to its boat in a capsize before racing began. The on-the-water safety team was at the scene within seconds to assist in the swift recovery of all the sailors, who were all unharmed. For Adam Minoprio and the crew on board SAP Extreme Sailing Team, Alinghi’s one win was not enough to dislodge them the top spot. With so few races, and limited points up for grabs, the teams further down the leader board are under added pressure to catch the Danes. However, Phil Robertson, skipper of Oman Air, does not seem fazed. „We are optimistic. It feels like we’ve made some steps forward and it looks like everything is coming together, so I’m pretty confident that we can throw out a good day tomorrow,“ said Robertson, whose team is no stranger to comebacks, having climbed from sixth to third overall on the final day of Act 2, Qingdao. „It was a long wait on the water but it ended up pretty well for us as the only race winners,“ said Arnaud Psarofaghis, co-skipper and helm of Alinghi, who currently sits in third, just nine points off the leaders. 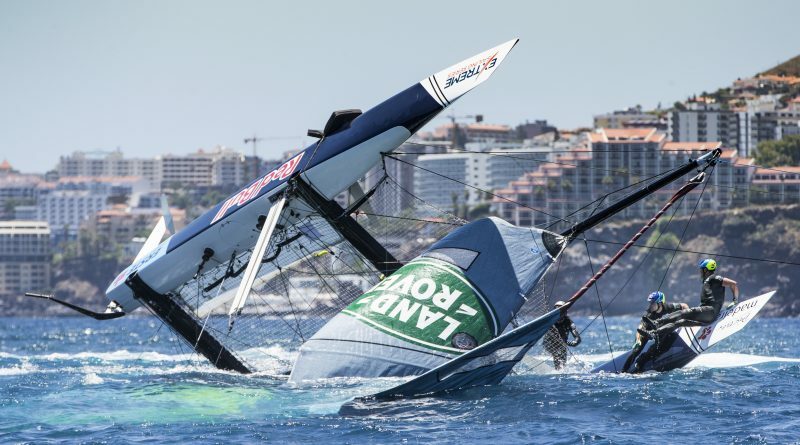 „The team did a really good job working in that shifty race and we’re hoping for more races tomorrow so we can come back on SAP Extreme Sailing Team,“ he added. Race Director John Craig faced a challenging day at work as he attempted to set a racecourse in the constantly shifting breeze. „The issue for today was that we had two different breezes, one coming from the southwest and one northwest, with a dead zone in between. This makes the racing really unfair and setting a racecourse becomes very difficult,“ explained Craig. Land Rover BAR Academy finished the race in fifth, meaning it remains in sixth overall. For wildcard Team Extreme, its glory came in the non-points scoring time trials that were run ahead of racing, in which it posted the fastest time. The Portuguese-flagged syndicate is helmed by 21-year-old Olivia Mackay, the only female helm in the fleet. The Flying Phantoms competed in six races, with four capsizes and one dismasting. 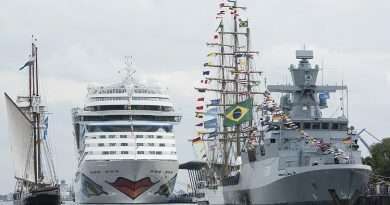 No sailors were injured. 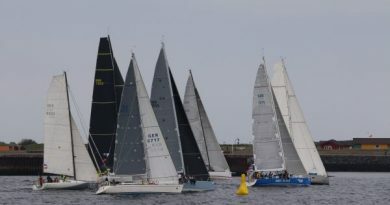 Red Bull Sailing Team retained its top spot, while Culture Foil climbed a rank to second, knocking ZEPHIR by Idrewa to third. Local Portuguese-flagged UON sits middle of the scoreboard in sixth place. The forecast is predicting more consistent winds for tomorrow, with the GC32 Stadium Racing scheduled to start at 14:00 UTC+1. With the final race counting for double points, it promises to be a thrilling finale to the Act, with everything still to play for. Fans can watch the action live on the official Facebook and YouTube, and live on TV from 15:30 – 17:00 UTC+1. 1st SAP Extreme Sailing Team (DEN) Rasmus Køstner, Adam Minoprio, Mads Emil Stephensen, Pierluigi de Felice, Nicolas Heintz 159 points. 2nd Oman Air (OMA) Phil Robertson, Pete Greenhalgh, James Wierzbowski, Ed Smyth, Nasser Al Mashari 152 points. 3rd Alinghi (SUI) Arnaud Psarofaghis, Nicolas Charbonnier, Timothé Lapauw, Nils Frei, Yves Detrey 150 points. 4th NZ Extreme Sailing Team (NZL) Chris Steele, Graeme Sutherland, Harry Hull, Aaron Hume-Merry, Josh Salthouse 134 points. 5th Red Bull Sailing Team (AUT) Roman Hagara, Stewart Dodson, Shane Diviney, Sam Meech, Will Tiller 131 points. 6th Land Rover BAR Academy (GBR) Rob Bunce, Owen Bowerman, Oli Greber, Adam Kay, Matt Brushwood 114 points. 7th Team Extreme (POR) Mariana Lobato, Olivia Mackay, Paulo Manso, Peter Dill, Micah Wilkinson, Elodie Jane-Mettraux 105 points.